This particular shot was taken back in 2007, August 21st to be totally exact. It’s amazing what you can find out about photos when you discover how to read all the hidden data in the files. I wonder did Ansel Adams [one of my all time favourite photographers of all time] ever think that the day would come when you didn’t need to carry around a notebook to record all the data about individual photographs. I remember back in the day when I still used film and I had to basically carry around a notebook to detail the settings on pretty much every single photograph I had taken. The reason behind that was simple, if you shoot ten rolls of film and end up with just one beauty then you really want to remember what settings you had on the camera so you could possible replicate that scenario. I still think the rules are pretty much the same except now digital cameras do all the dirty donkey work for me. Back to the subject of Ansel Adams again, if I may rewind quite a bit. I was in town today and to be honest I must admit every time I see one of his books I tend to be drawn towards it. At this stage I think must have every photograph he has published in one of my many books but I was attracted to a book featuring a collection of his colour photography. This man is one of the greatest black and white photographers of all time so I almost felt obliged to complain to the shop owners and ask them to remove the book from their shelves, I don’t disagree with colour photography, I simply don’t like it myself. I have often thought how cool it would be if I could go and have an operation to stop my eyes actually seeing in colour anymore, imagine the world in black and white all the time, next thing I would be saving up for the infra-red operation. 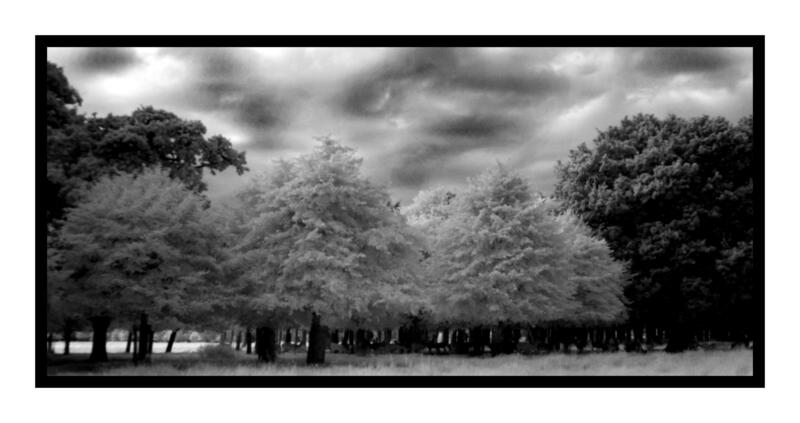 This entry was posted in Black and White Photography, Infra-red Photography, Irish Landscapes, Phoenix Park and tagged Black and White, Dream Like, Infra-red Photography, Phoenix Park, Photography, Tall Trees, Trees. Bookmark the permalink. ← An Explosion Of Trees. Did you get anything good in that mad wind at the weekend? I was out in it on Sunday for a while but it was just too strong to get anything worthwhile. Also Paddy was getting a bit bored standing around waiting on me to do stuff himself, he is still not that committed to the photography lark. This work is fab, I really love these images Dave. Thanks.